Discover why the new Archbishop of Canterbury is truly a man of the present age for the present age. This brief and insightful biography reveals Justin Welby's influences and likely influence. Want to learn how an Oil Exec became Archbishop of Canterbury? Introducing the new Archbishop of Canterbury, this brief but insightful biography of The Rt Reverend Justin Welby, follows the influences and influence of the new leader of the worldwide Anglican Community through his education, conversion, commercial career and church life. From the 105th Archbishop of Canterbury’s earliest years to his enthronement in 2013, author Andrew Atherstone explores Welby’s formative years and his education including his conversion to Christianity while a student at Cambridge University. It examines his successful career in the financial tiers of the oil industry and his rise through the ranks of the Church of England from rector in Warwickshire, through director of international reconciliation ministry at Coventry cathedral and on to Dean of Liverpool and Bishop of Durham. Drawing on personal observations and interviews with the archbishop's friends and colleagues, this study combines human accounts with formal archival material to analyse Justin Welby’s current leadership style and to forecast his likely priorities and passions – especially in his favoured areas of evangelism and reconciliation, combined with his business world experience, of shrewd management and risk-taking. The book is informative and interesting to any with a concern for the possible changes of direction for the Anglican Communion and the effect of this latest change of leadership. Archbishop Justin Welby by Andrew Atherstone was published by Dalton, Longman & Todd in March 2013 and is our 8042nd best seller. The ISBN for Archbishop Justin Welby is 9780232529944. So you wondered at Justin Welby's "meteoric rise", as it's often called, to the post of the 105th Archbishop of Canterbury? He's a bit young to be an Archbish isn't he (57)? What sort of man is he, and what are his qualifications? This little biography (it's "unauthorised", as the writer is keen to point out) will answer your questions. Andrew Atherstone, who is a Tutor and Fellow at Wycliffe Hall, Oxford, has written what he calls "the tale of Welby's road to Canterbury". I found the tale became fascinating with Welby's years at Enterprise Oil, where his leadership and management gifts developed - all to prove useful for his later role in the Church, as was his reflecting on the ethics of finance. Equally interesting for me was the account of Welby's time at Coventry Cathedral's International Centre for Reconciliation, which led him into situations of great personal risk, and left him with a passion for justice and reconciliation. Once again these experiences shaped the future archbishop's convictions and suitability for Canterbury. The book finishes before Welby's enthronement in 2013, but it is a helpful, popular and readable account of all the phases of his life up to then. Andrew Atherstone has written much about the Anglican Church, and describes it as being "as much in turmoil as ever before", with its future shape hanging in the balance. It was into this "war-torn context" that "Justin Welby the reconciler was plucked from the Diocese of Durham and thrown upon the international stage as the next Archbishop of Canterbury". Yes, it's quite a story. But we should recognise Welby's deepest desires, which are: for the Church to emphasise evangelism, worship and unity, and for himself simply to be known as "someone who loved and followed Jesus Christ". Take a peek at some articles related to Archbishop Justin Welby. 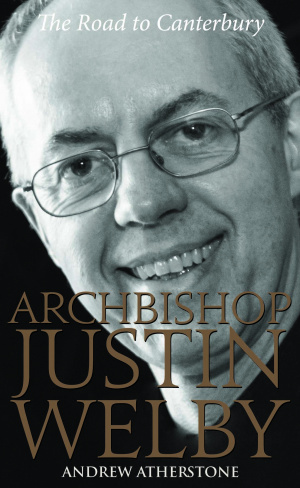 This biography of Justin Welby, the 105th archbishop of Canterbury, traces the story of his life and ministry from his earliest years to the eve of his enthronement in March 2013. The book examines his conversion to Christianity as a student at Cambridge University, his career as a treasurer in the oil industry and his meteoric rise through the ranks of the Church of England - as a rector in Warwickshire, director of international reconciliation ministry at Coventry cathedral, dean of Liverpool and bishop of Durham. Andrew Atherstone is tutor in History and Doctrine, and Latimer research fellow, at Wycliffe Hall, Oxford. He is a fellow of the Royal Historical Society, and has published widely on a number of Anglican personalities such as Charles Golightly (Oxford's Protestant Spy, Paternoster, 2007), and George Carey. Based on extensive archival research, and interviews with the archbishop's friends and colleagues, this study analyses his formative relationships, leadership style and priorities for the church. It highlights Justin Welby's passion for evangelism, reconciliation and risk-taking, which mark a change of direction for the Anglican Communion. Until his ordination in 1992, Archbishop of Canterbury, Justin Welby, as a successful senior executive finance officer within the multibillion dollar empire that is the oil industry for 11 years. "I drifted into it,” he told The Guuardian in July 2012, “because I couldn't get a job when I left university.” He ended up working for Elf in France on their international finance team, partly because they needed someone who could speak English, didn't know anything about anything and so could have a fresh view on the future of the French oil giant. He turned out, in his words to be ‘reasonably good at it’ and ended up as group treasurer for Enterprise Oil PLC. Later he worked in the Niger Delta, where oil companies were involved in the wholesale exploitation of local communities, thus prompting years of violent civil conflict. Still only in his 20s, this was to be a turning point in his young life. He began to realise it was dirty business. Later, a number of his former colleagues were arrested for corruption. But the turning point came in a time of personal tragedy. On his return from Africa in 1983, his seven-month-old daughter Johanna was killed in a car crash in France. "It was a very dark time for my wife Caroline and myself,” he said in interview, “but in a strange way it actually brought us closer to God. In 1987, he resigned from the oil industry and decided to become a priest. Since ordination, Welby has returned to Nigeria many times, working on justice and reconciliation. Revd Dr Andrew Atherstone's book Archbishop Justin Welby: The Road to Canterbury. Gives you a short, lively and informative look at Welby's life from his formative years, education, and eleven year career in the oil industry to his ministry. As well as his theology and world view, there is a concise examination of his writings and how they inform his thinking.